The latest four star hotel to open in Domlur may be geared to business travellers, but the restaurant is squarely aimed at the locals. A no-fuss a la carte menu runs in the evenings, while the weekday midday buffet is perfect for a lunch with colleagues. 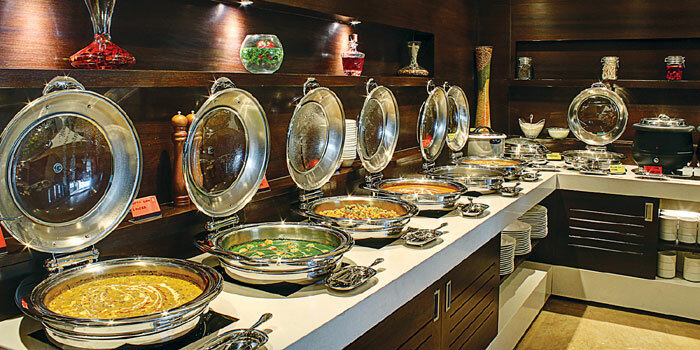 Eat your fill at the buffet, which has something for everyone: an assortment of vegetarian and non vegetarian options, and a mixture of Western, Asian and Indian cuisine. Two soups, six salads, four starters, ten main courses and eight desserts are always on offer, so you are spoiled for choice. We had a delicious cream of broccoli soup, as well as an eclectic range of starters: tandoori paneer tikki and chicken reshmi kebab with an egg white topping on the Indian side, and an unusual (but delicious) canapA�, combining fresh prawns with a seasoned mash potato base. For our main course, we selected a perfectly cooked chicken breast stuffed with melted cheese and mushrooms, and a side serving of couscous mixed with herbs and bell peppers. The a la carte menu is not extensive, but ita��s carefully curated and executed. Try the grilled tenderloin steak served on a bed of rosemary potatoes along with grilled vegetables, or the Indonesian wok-tossed rice with your choice of chicken, shrimps or egg. For a more informal evening, you can also choose to sit in the comfortable bar area overlooking the lobby, and grab a pizza or some beer-battered fish to eat alongside the tipple of your choice.